What the hell is that bear doing to that pig? 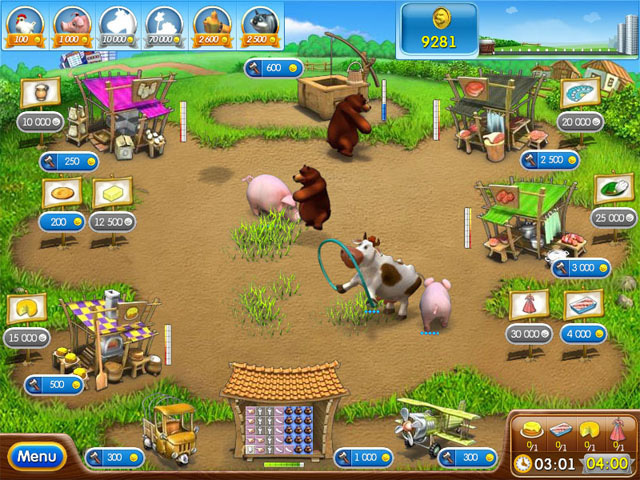 Alawar Entertainment combined the love of animals with the art of making money when it released the Farm Frenzy franchise for smartphones and personal computers. Those that have missed out on the “frenzy” can now join in on the fun as the game has arrived on the PlayStation Network in the form of the PSP Mini, Farm Frenzy 2. At first glance, the game appears friendly and welcoming with all the happy animals coming to life. The visuals and animations may not necessarily leap out, but they do the job in making the overall setting presentable. Unfortunately, there is only one song that plays continuously, which you’ll have to learn to overcome. Otherwise, you may be driven to insanity with its repetition. Farm Frenzy 2 is all about managing your resources, making decisions in terms of logistics and equipment, and, of course, trapping bears. When you first enter the game, you’ll be tasked with placing grass on the ground to help nourish the chickens running around in the field. Of course, in order to replenish the grass, you need to have a running supply of water, which could lead to paying to use the well. Failure to do so will lead to your chickens’ death. If you take good care of them, they’ll eventually lay eggs, which you’d want to have placed in your warehouse. Besides the chickens, there are other animals that will help you in your quest to build your farming business. What I find peculiar, though, is that Farm Frenzy 2 features pigs that you’ll be using the meat cutter on to “fulfill their destiny.” Still, parents shouldn’t have to worry about any violent content here as this game is friendly to audiences of all ages. Later on, you’ll be spending money on obtaining a number of different buildings that turn the items that your animals produce into pay dirt. In fact, the more you progress, the more unlockable food products and buildings you’ll be working with. Additionally, for each building you can perform up to three upgrades to make them more efficient and productive, thereby adding an element of strategy and planning to the game. The level of difficulty can be quite high when you have many different aspects to keep track of, but you can still find yourself easily addicted to it because of how Farm Frenzy 2 forces you to become engaged in its gameplay in the first place. It doesn’t stop there, though, as through the available delivery channels you’ll need to select which goods you want to sell (and how many) to the supermarket as well as the items you want to purchase. The car will fulfill such a task and return with your orders. There’s also a plane, which will take your purchase orders and send the goods to your farm via parachute. As a result, you’ll need to either pick them up yourself from the ground or have a cat fetch them for you — leave them unattended for too long and they’ll disappear. And let’s not forget those pesky bears that show up to throw animals out of your farm. To prevent this from happening, you’ll want to capture them in a cage and hold them in the warehouse to be sold to the market later on. The panda bears appear more often, which I guess should be expected since there’s plenty of bamboo shoots around??? Take note that the main game also has you going through scenarios with different objectives and time limits. Furthermore, you’ll be rewarded with bonus points based on your performance. However, as you go further in the game, you’ll be able to access the unlimited mode where you’ll put your farming system to the test. At that point, you’ll be able to take on the challenge through a different approach, thereby extending the game’s longevity. Your love for farm animals should get your running to the PS Store for this particular PSP Minis title, available for $4.99. Farm Frenzy 2 will not only give you a greater appreciation for farmers, but it will create a “frenzy” of fun and entertainment as well.